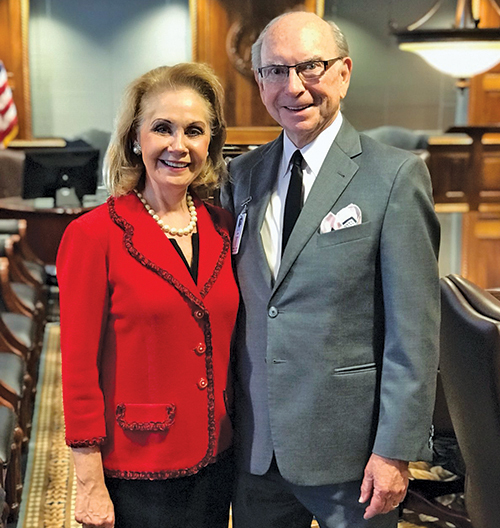 Justice Debra Lehrmann is the new Supreme Court liaison to the State Bar, replacing Justice Phil Johnson, who retired from the court on December 31, 2018. Above: Justice Debra Lehrmann, the new Supreme Court liaison to the State Bar, with State Bar President Joe K. Longley. Photo courtesy of the Austin Bar Association. The Dallas Bar Association elected Laura Benitez Geisler to serve as its president in 2019. Geisler, who was sworn in January 12, is the first Hispanic member of the DBA to serve as president. Other officers serving on the board are Robert Tobey as president-elect, Aaron Tobin as first vice president, Karen McCloud as second vice president, Ashlei Gradney as secretary/treasurer, and Immediate Past President Michael K. Hurst. Those serving on the board of directors include Vicki D. Blanton, Jonathan Childers, Chalon Clark, Sakina Rasheed Foster, Charles Gearing, Rocio García Espinoza, Judge Martin Hoffman, Krisi Kastl, Bill Mateja, Judge Audrey Moorehead, Kathryne Morris, Cheryl Camin Murray, Judge Erin Nowell, Javier Perez, Sarah Rogers, Mary Scott, Jason Shyung, and Victor Vital. Photo courtesy of the Dallas Bar Association. The 2019 Leadership Academy held its opening retreat on January 8 at the Texas Law Center. The class took a tour of the Supreme Court with Justice Debra Lehrmann, State Bar of Texas President Joe K. Longley, and State Bar of Texas Executive Director Trey Apffel. Each year, about 30 members are selected for participation in the academy, a five-month program designed to assist Austin-area lawyers in improving their community, serving the Austin Bar Association, and promoting professional development. The class works on a project that benefits the Austin Bar Foundation and its pro bono endeavors. While the number of Texas attorneys increased by 23 percent over the past 10 years (83,713 to 103,342), the increase from 2017 to 2018 marked the smallest annual increase in 19 years. This trend can be attributed to a 16 percent decline in law school enrollments (7,602 to 6,402) from 2008 to 2018. Over the past 10 years, the Texas attorney population continued to become more diverse. The number of women attorneys increased by 41 percent, and the racial/ethnic minority population increased by 69 percent. The fastest growing age cohort of Texas attorneys is of those age 65 or older. This group more than doubled over the past 10 years (7,969 to 17,937). Solo practitioners still make up the single largest occupation group of Texas attorneys (22 percent). However, more attorneys went into corporate/ in-house counsel than any other field from 2008 to 2018. To see the rest of the profile, go to texasbar.com/research.